It's never been more fun and rewarding to support local art than this coming Saturday! Join us this Saturday at Second Self Beer Company to celebrate everything that starts with the letter 'A'! 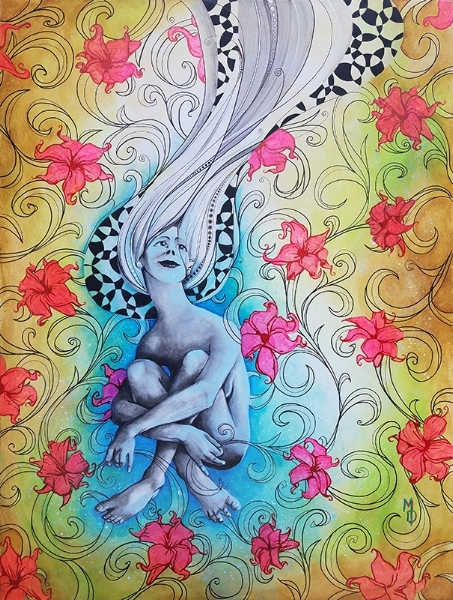 Click the below to enter the raffle for this piece! The event starts at 4 pm on Saturday, April 4, 2018 and Matthew will be performing acoustic versions of almost his entire discography. For a preview of what sonic goodness awaits you, click here! Bring your friends, we can't wait to see you there! Have you read what the internet has to say about our newest album? Pacifico-friends, -lovers, and -supporters: We may have been quiet but we have not been idle. This new year brought on a move, a new job, new music, and new and out-of-the-ordinary shows! 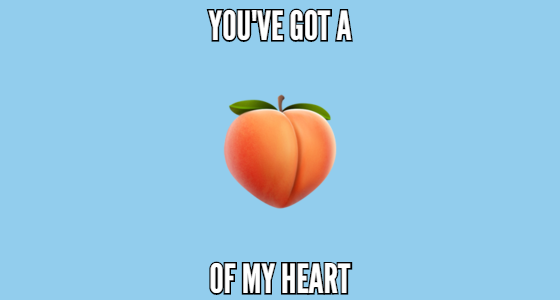 Have we "peached" your interest? After seven amazing years in Louisiana we have decided to take on a new challenge and move back to where it all began: Georgia. This is where Pacifico's story began and we are ready to add another successful chapter here at our new old home. Look out for opportunities to watch us play live in the Greater Atlanta area, starting with this year's first show on Saturday, April 7! Not only are we excited about the many musical projects we have planned here, we are also thrilled for Matthew's new job at the very place that supplied every single amazingly soft and stylish Pacifico shirt ever made: Terminus Tees. Matthew joined the Terminus family early this year and now he can help you make your merch dreams come true! Our first show of 2018..
..is near and it will be a spectacle you don't want to miss! Join us at the Second Self Brewery for art, aerials, some of Atlanta’s finest craft brews, and of course Pacifico live. You can even enter a raffle for a chance to win an original painting by the artist Miles Davis! Do you like remixes? We sure do! The first remixes of songs from our newest release, Everest have just started to come in and we cannot wait for you to hear them! Want to make your own remix? Don't worry, we are still accepting submissions. If you would like to try your hand and remix one of our new songs, please reply to this message or write us an email at pacificorock@gmail.com! 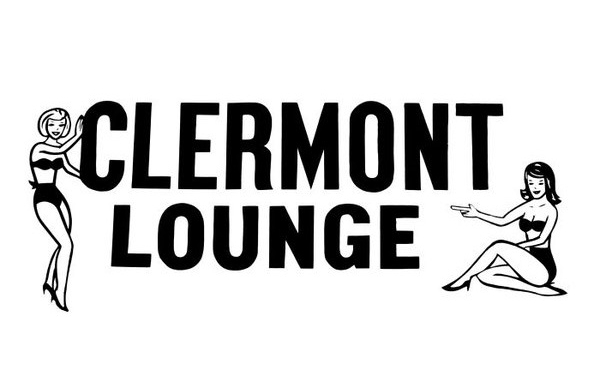 We'll be playing at the Clermont Lounge! Yup, that's right. THE infamous Clermont Lounge. Don't miss out on the show of a lifetime. Pacifico, The Menders, and lots 'n' lots of fun. May 31. Be there or be square. If you haven't listened to our newest album Everest, please be sure to check it out. You can find it on our website, Spotify, Bandcamp, iTunes, Amazon, and Youtube. Everest is truly a labor of love that has taken years of sweat, tears, and the help and creative ideas of many collaborators to come to fruition and we are so proud of the result. If you like it as much as we do, consider supporting us by purchasing a vinyl, a digital download, or by leaving us a tip. Your support means the world to us! Check it out! AXS posted an exclusive premiere of our second single "Beautiful", which will officially be released this Friday. Don't forget to pre-order your copy of "Everest" before it comes out on October 20th! Check out our awesome tour poster! The amazing Emily Elizabeth Williams painted us and our instruments for our tour poster, and we couldn't be happier with how it came out. Check it out! You can own one of these bad boys too, if you'd like. Just go to our merch page or to bandcamp (where you can also pre-order our album). We have only 11 days to go until our album release show at the Spanish Moon on October 12, and we leave for tour in 17 days! Hope to see you out in the real world soon! Weeee!! You can now buy "Go Alone" and pre-order "Everest" everywhere! Our new single "Go Alone" can now be bought on all the major music outlets! And our album "Everest" can be pre-ordered everywhere too! If you pre-order "Everest" on Bandcamp, you get an immediate download of the single "Go Alone"! Check it out! Live AMA tonight on Facebook! Today marks the second-to-last day of our pre-order/crowdfunding campaign on indiegogo (igg.me/at/pacificoeverest) and we are going to have a facebook live event tonight! You can ask anything and everything you'd like and we'll perform a few songs too! Head on over to facebook.com/pacificorock at 7 pm Central and don't miss out! New Lyric Video for "Go Alone"
We are proud to show you our new lyric video for our first single "Go Alone"! Go Alone is about something many of us fear: being alone. It's about overcoming those anxieties and finding solace in yourself, ultimately creating something beautiful that was in you all along. To pre-order "Everest" and get your copy of "Go Alone" go to http://igg.me/at/pacificoeverest and please share! Hey I wanted to take a moment to be real and honest about who I am, what I’m doing, why I’m doing it, and where you fit in. First off if you want the short answer: I am not asking for money, I’m not asking for handouts, I don’t want you to help me realize my dream. I am just looking for people that believe in me, people who like the art i create and/or people who even just believe in quality independent art to preorder my new album and get some pretty awesome stuff in return. And if you really like it to share with your friends, followers, and family. For people that want more: Making this crowdfunding campaign was really a hard decision for me to make. I tried in 2010 to do a kickstarter for my last album Without Heroes and it did not go well. At the time I did not know how to market myself, not many people, including myself, knew or understood what a crowdsourcing campaign is (some still don’t) and I even received some very mean emails at the time too (I’ve gotten some this time too). I didn’t reach my goal, my heart was wrecked and I gave up. I quit music for a while and did some soul searching. Which is why it took 3 years for “Without Heroes” to come out. I have always had a tumultuous relationship with music. Unlike some, music is not something I chose. I don’t write songs cause I want to, and I don’t release it for my ego. It’s actually quite the opposite. I wouldn’t even say I write anything. I believe Bob Dylan said it best when he said something like “I’m just a satellite receiving messages”. I too am just a mouthpiece for someone/something bigger. Music comes to me and rather than writing it, I chase it trying to find out what it’s supposed to be. The reason I release it is because I believe it was given to me to share and can’t be made only for my enjoyment. I am not trying to “Make it” any more. I have a full-time job as the general manager of a successful Crepe restaurant and I love it. Truth be told, there isn’t even any “making it” anymore anyways (that’s another conversation) I believe just like with the resurgence of supporting local businesses and such we need to take the stigma off independent artists and start to support them. I know too many AMAZING visual and musical artists that you’ve never heard of that make just as good if not better art than their famous contemporaries. I have had my brushes with fame and I am more than happy with where it’s taken me and what I’ve accomplished. I honestly have done everything musically I have ever wanted to do. I wouldn’t have met the love of my life, be the man I am, or create the music I have otherwise. I am very grateful for that. Finding a healthy place for music was hard. Shifting my focus from writing, recording, and touring to my responsibilities and putting music in a healthier spot was difficult to say the least. I had to take a year off, a year away, facing my demons and I came out stronger for it. I now work hard and put everything else I can into the art I have been given, knowing that if one person can connect to a song I’ve done then that’s what I was created for. So why is a 38 year old man still doing music with his “little band”? Why am I still recording and releasing music? Why did I make a indiegogo? I’m a professional musician. I spend about 300 days of my year recording, writing, performing my music, and helping others with theirs too. I think crowdsourcing is a necessary evil. With labels not able to accommodate artists, it’s practically the only way to make music nowadays, it’s basically the new pre-order platform. I believe in supporting beauty, especially in a world without much beauty left. 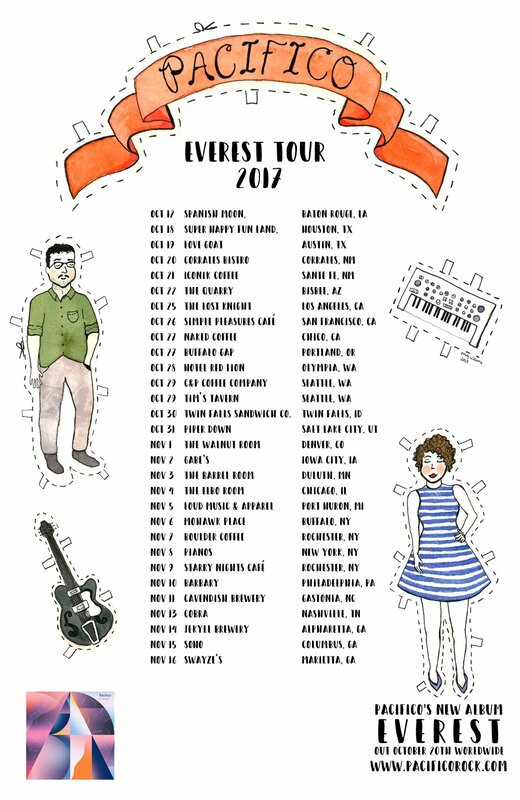 A digital version of Everest, a vinyl of Everest, a special edition songbook with lyrics and artwork (only available during the Indiegogo campaign), T-shirts, Stickers, a Pacifico tumbler, a Pacifico Koozie, a day of rock climbing with Uptown Climbing, Test Pressings, tickets to our shows on our US tour, every one of our previous albums, a private concert, your very own puppet by Beyond The Garage the very company that did the puppets and the video for “I’ve Finally Found What I’m Looking for”, I’ll cover any song you choose, I’ll produce a song for you, or perform a private concert.